It’s all about range, kWh/100 mi, and MPGe. A big reason for this is the manner in which vehicles are tested. Contrary to what you might expect, they’re not driven on the open road. Rather, a vehicle’s energy consumption is determined in a laboratory using a standardized procedure that’s mandated by federal law. Each vehicle tested is “driven” on a device called a dynamometer. Think of it as a treadmill for cars. While the engine and transmission drive the wheels, the vehicle never moves, just the rollers upon which the wheels are placed. A professional driver runs the vehicle through multiple standardized driving schedules to simulate city and highway motoring. 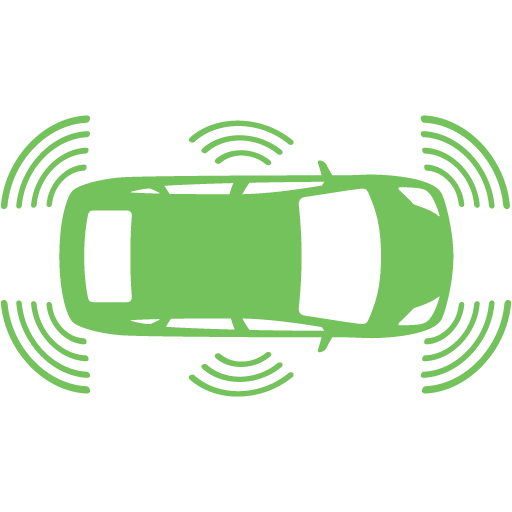 The basic city-driving program replicates a rush-hour stop-and-go driving experience with frequent idling. The highway circuit is designed to emulate rural and interstate freeway driving at higher speeds, without making any stops. An electric vehicle is tested after being parked overnight, and with the battery fully charged. It’s then operated through successive city or highway driving cycles until the battery becomes depleted. It’s then brought back to a full charge. A technician determines the vehicle's energy consumption by dividing the kilowatt-hours of energy needed to replenish the battery by the number of miles driven. The latter is also used to determine an EV’s estimated operating range on a charge. To help consumers compare the energy consumption of electric cars with those that run on fossil fuel, the EPA created a miles-per-gallon equivalent measurement, called “MPGe.” This is calculated based on a conversion factor of 33.705 kilowatt-hours of electricity equaling one gallon of gasoline. For 2018, the EPA’s most energy-efficient EV is the Hyundai Ioniq Electric, with a rating of 150 MPGe in city driving and 122 on the highway. 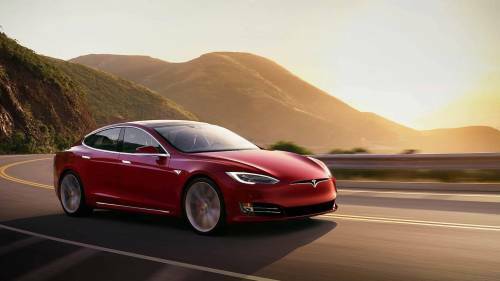 The next-highest 2018 models are the Tesla Model 3 Long Range at 136/123 MPGe, the Chevrolet Bolt EV at 128/110 MPGe, and the Volkswagen e-Golf at 126/111 MPGe. Unfortunately, there are elements inherent in the EPA’s testing procedures that tend to skew the ratings. For starters, vehicles are tested without a full load of passengers, cargo and options aboard. All else being equal, the heavier a vehicle’s rolling weight, the more energy is needed to reach and maintain a given speed. Also, the tests are conducted indoors at room temperature. An electric car’s range tends to suffer when subjected to extremely cold or hot weather. This is both because of the adverse effects of high and low temperatures on a battery’s charge, and the drain caused by operating the heater and air conditioning. What’s more, a given motorist’s driving habits can also affect an EV’s energy consumption. Lead-footed acceleration and driving at higher speeds will tend to drain the battery faster than will maintaining a smooth and steady pace. Driving on under-inflated tires will also cost an EV owner additional kilowatt-hours of electricity. The federal government requires automakers to include information on a vehicle’s energy consumption, along with pricing and other information on the so-called “Monroney” sticker that’s posted on every new light-duty vehicle sold in the U.S. It’s named for Almer Stillwell “Mike” Monroney, a U.S. Senator from Oklahoma who sponsored the Automobile Disclosure Act of 1958 that mandated the use of price stickers. 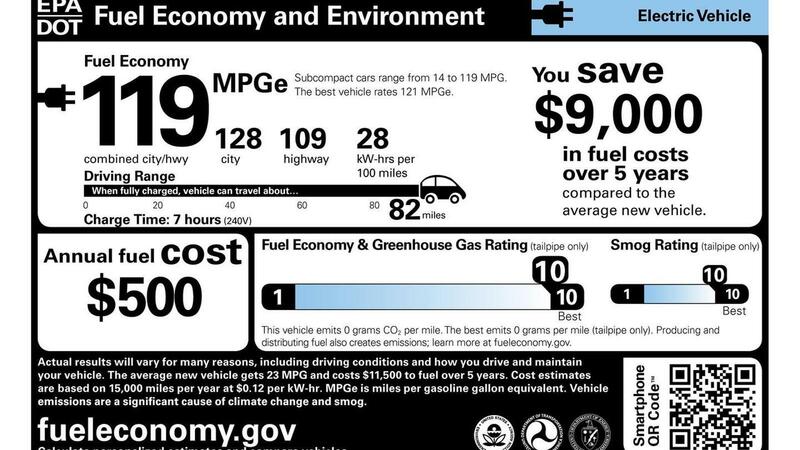 In the case of electric vehicles, the Monroney sticker prominently displays the MPGe estimates for city, highway and combined city/highway driving. The latter assumes 55 percent city driving and 45 percent on the highway. The sticker also shows the number of kilowatt-hours of electricity that’s needed to run the vehicle for 100 miles (this is expressed as kWh/100 mi). The EPA says this measurement is actually more meaningful when comparing costs and energy consumption between EVs than the MPGe rating. The sticker also notes, on average, how many miles the vehicle can operate on a charge, and how long it takes to fully replenish a discharged battery using a 240-volt (Level 2) charger. You can expect the time to typically double when using a standard household outlet. 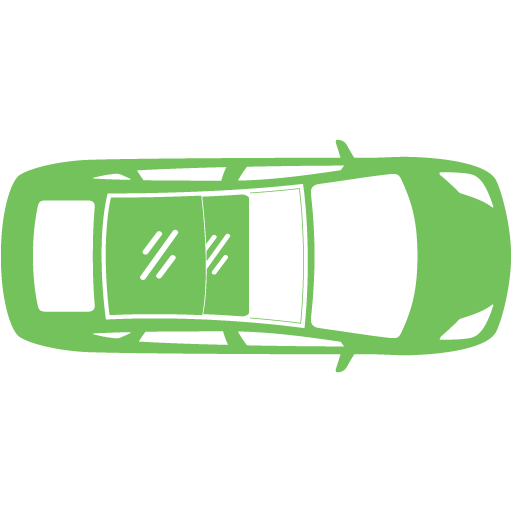 The window sticker further notes the energy consumption range for other models in the vehicle’s size class. You’ll also find the average annual cost to keep the car or truck running, based on 15,000 miles driven at a predetermined price per kilowatt-hour for electricity. It also shows how much more or less that amount is compared to the average vehicle over a five-year ownership period. These numbers will of course, differ for a given driver depending on local energy rates. The sticker also provides ratings on a 1-10 basis for a vehicle’s smog-related tailpipe emissions and greenhouse gas emissions. Since full electric vehicles produce neither of these they automatically receive a rating of 10. You’ll also find a “QR” code that can be scanned by a smartphone and takes users to a website where they can enter information about their commutes and driving habits to get a better estimate of their energy consumption and costs. The above information can also be found on the EPA’s fueleconomy.gov website for easy comparison among competing models, and it’s available for all current and past plug-in and conventionally powered vehicles. 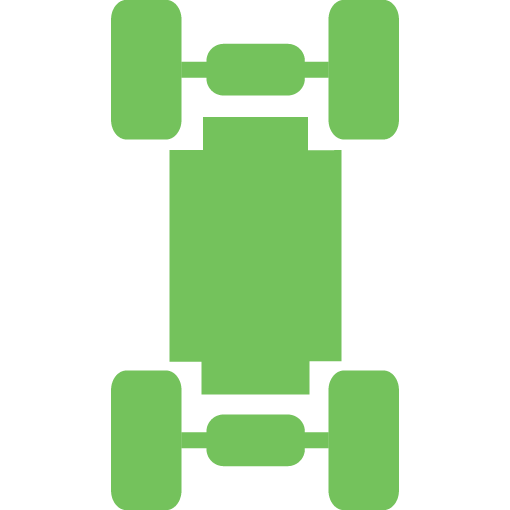 Be sure to check out other helpful information on electric vehicles here on MYEV.com, which is also the Internet’s prime – and free – marketplace for buying and selling EVs.